In this installment about open space use on the summit, I would like to discuss what seems to have become one of the hotter of the hot button issues concerning trail use, mountain biking. Let me start out by letting you know that I am a mountain biker and have been riding the trails on the summit for over 15 years. I do not consider myself an expert rider and ride the trails strictly for the physical workout and natural enjoyment of the area. I believe that there are a lot of misconceptions that people have concerning mountain biking in the summit area and I would like to discuss some of them here. Some of the issues concerning hiking have been discussed in a previous post and many of the points concerning the policy of multi-use trails that were discussed also pertain to mountain biking, so you might want to take a look at that post if you haven’t already. 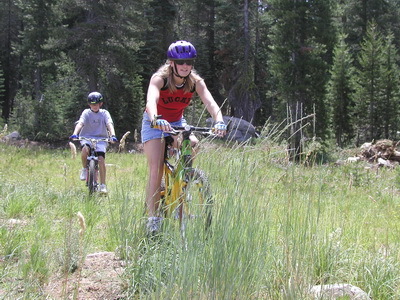 It is important to understand that like many outdoor activities, the term “mountain biking” encompasses a full spectrum of activities that involve a bike and outdoor terrain. They go from the sublime to the extreme. Unfortunately, the rhetoric that you hear about mountain bikes on the trail often lump all of these activities together and apply them to local conditions. You will hear that mountain biking is an “extreme sport” that will result in mountain bikers “screaming” down our trails and if you venture out there you will be taking your life in your hands. Everyone has seen the X-games and has seen the extreme side of the sport. I have heard these comments coupled with the statement that hiking on the other hand is a moderate activity that does not present the dangers of the extreme mountain biker. We can all identify with a leisurely hike. I would point out, however, that people have the amazing ability to take anything to the extreme. Case in point, consider hiking taken to the extreme, The Tough Mudder. My point here is not that mountain biking can’t be an extreme sport, but that riding in the summit does not involve the extreme side of the sport. Riders on the summit are primarily cross country trail riders that, like hikers, are out to explore the area and get a good physical workout while enjoying the outdoors. The terrain on the summit is not really suited for the more extreme activities of the sport like freeriding and down hilling. The terrain is either too flat or too steep and the wide flat trails that are in the area don’t lend themselves well to thrill riding. I think most of the riders that visit the summit would agree that the more extreme parts of the sport are better left to other areas like ski resort hills and formal mountain bike parks that can cater to the technical parts of the sport. Personally, I would oppose any effort to allow extreme riding on our mult-use trails. This is something that the TDLT is well aware of and it is why they have designated a few “mountain bike” only trails away from the multi-use trails to accommodate any riders looking for a more challenging ride. This is a very old argument that not only pertains to mountain bikes, but to trails in general. The fact is that any trail whether natural or man-made contributes to the erosion in the area. There is in fact a wealth of literature available on trails, trail design and the impact they have on the environment. Just Google “trail design”. As you might imagine there have been a lot of studies on the effect of mountain bikes and I have read several. As with many issues you can find data to support it’s pros and cons. The bottom line in my mind is that all trail activity has an effect on the environment and the important thing is to design and maintain the trails to minimize their effects. When the trail plan was presented by TDLT in the summer of 2013, it was clear that many of the trails were existing ski trails (which were originally logging roads). These trails had in no way been “designed” for any use other than removing logs or skiing on 5 ft of snow. Certainly they had not been subject to modern trail design techniques to minimize effect. TDLT made a very informative presentation on trail design at their presentation. To address some of the issues with the local trails I did a survey that summer with mountain biking in mind. What I found interesting in that survey were the observations of minimum effects on the trails after a 24 hr mountain bike race run that summer that had literally thousands of mountain bikes running on the trails. Subsequently, a group from TDLT, SLCWD and a local hydrologist, John Cobourn, did a walking survey of the trails around Serene Lakes. They were able to identify problem areas which TDLT plans to incorporate into their trail design plan. While there is no denying that trail use, including mountain bikes, has an effect on erosion, these effects can be mitigated by proper design and maintenance of the trails which is the intention of TDLT. Considering that the existing trails have never been maintained before, the argument can be made that with the design and maintenance program planned by TDLT, the effects of trail use in the future will be much less than in the past, even with increased use. This is a cry that I have heard raised about the trail plan. When we got our first “mountain bikes” back in the 80’s (that was just a normal 10 speed bike frame with some larger knobby tires) we drove over to Mt Tam to test them out. This was long before it became a mecca for Bay Area down hillers. The draw is the same as it is now, you could drive to the top and then ride (coast) down the trails. I have to admit it was a pretty exhilarating experience on a bike with no suspension. Today riders with full suspension bikes flock to the top and do scream down those trails. No one can deny that trail conflict is a big issue in Marin. When I look around the summit, I have a hard time equating anything here with Mt Tam and Marin county. Just about everything I can think of is different from the weather to the terrain. But the primary reason that the Summit is not like Marin count is shown in the graphic below. It’s the people. As the map shows, the population within a 20 mile radius of Mt Tam is 80 times the population of the center of the Royal Gorge open space area. Isn’t that a big reason why we all come here? The Summit is not Marin County and it never will be. That includes the mountain biking. Sure we will have the occasional thrill seeking bay area mountain biker drive the 3-4 hours to come up here, but that’s not the same as having thousands of mountain bikers about 20 minutes away. This is sort of a variation on the “build it and they will come” argument. This assumes that the summit has been a secret until now and mountain bikers didn’t know it was here. This is not the case. 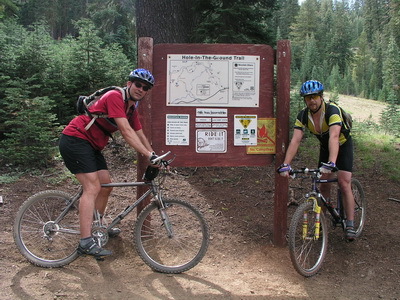 We are fortunate to have one of the best trail rides in the Sierras right on the summit, The Hole in the Ground Trail. This trail is world famous and mountain bikers come from all over every year to ride the route. I have ridden the trail a number of times and have also hiked it. It is a wonderful trail ride or hike. 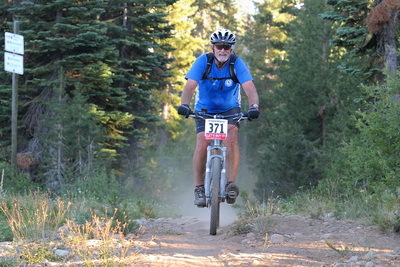 The trail is meticulously maintained by a number of organizations including mountain biking groups and I would hold it up as a perfect example of what mountain biking on the summit is all about. It is a cross country trail ride that really tests the skill and stamina of a rider. I have hiked the trail during bike season and have had only positive interactions with riders. There is no reason to think that riders coming to the Royal Gorge trail system will be any different than those coming to Hole in the Ground. The truth is that the majority of the riders on the Royal Gorge trails are going to be local residents and vacationers with their families. When my kids were young we road on the ski trails and when I ride now on the rare occasions that I do see other riders they are often whole families out on their bikes. Sure we are going to have the occasional irresponsible rider out there, but that is the world we live in. I firmly support the policy of “Howdy” that TDLT is promoting for the trail system and believe that with proper signage to guide users, everyone, including mountain bikers can use the trails together. We just need to give it a chance this summer. Next post will have a discussion of the our four legged friends that helped to win the west. You call that extreme HIKING??? I call it extreme “hiking” in the same way I would call the freeriding in this video extreme mountain biking. The Tough Mudder takes foot travel over terrain (hiking) to the extreme the same way freeriding over obstacles takes mountain biking to the extreme. The point is that anything can be taken to the extreme, but that is not what will be happening on the summit, either for hiking or mountain biking. Thanks George for the continuing education about the Royal Gorge property. I am looking forward to a summer filled with hikes/walks and a little biking. If I had a horse I would be out there on it too! My main observation is that although George and I agree about most of the “facts,” we vary vastly in terms of the conclusions those facts demand. According to George, those of us who want more footpaths are biased and suffer from feelings of entitlement. I absolutely agree on the bias but would suggest that all of us are biased, including George. In terms of entitlement, I do not believe that I am entitled to anything specific vis-à-vis the trails, but do believe that all of the Serene community is entitled to a fair voice. Royal Gorge surrounds us and although there are many other stakeholders in the outcome of the Royal Gorge trails, it is the Serene Community that is most impacted. Even the Land Trust recognized this in their outreach. The Land Trust specifically asked cycling groups if there were any cycling trails out there that circled residential communities. The Land Trust’s outreach left some residents feeling like their voices were not heard. This is not surprising given the short time the Land Trust performed outreach, the nature of the community’s residency, and the preferences of the main decision makers. The main Land Trust designer favors multi-use trails and many of the biggest voices in the community, including George, favor multi-use trails. Many residents hoped that because of the mission and goals of the SLPOA Stewardship Committee, that the community would be adequately polled. But the Stewardship Committee only tag-teamed the Land Trust’s outreach and set up tables at Lot 1 during the summer. For those who do not visit Lot 1, the Stewardship Committee had no autonomous outreach. Further, as evidenced by the comments attached to George’s blog, many of the Stewardship Committee have expressed their own bias in favor of multi-use trails, which is fine. But, the job of the Stewardship Committee is to poll the Community, and to fairly report the results of the poll without coloring the results with individual bias. So, my perception of the survey that was sent out by a group of walkers (that George maligns) is that it was intended to get to the feelings of the Community. Does almost everyone favor multi-use trails as George and the Land Trust would have you believe, or is there a portion of the Community that feels differently? If so, how large is that portion of the community? The true crux of the problem is that NO ONE KNOWS how much the trail system is going to be used. If, as some folks propose, the increased use will NOT be extensive, then I anticipate few problems. BUT if the trail system is used in the manner the Land Trust would like to see, we can anticipate a lot of extra visitors that have NO stake in our Community. If the trail use is exponentially increased, conflicts on and about the trails are undoubtedly going to occur. George’s factual rendition is mostly accurate. The trail system is extensive and should allow for folks to use the trails without a lot interface (if the trail use does not increase a lot). Although George uses this to argue that the multi-use trail users should have little interface, I use it to argue there is no reason to not to have single-use footpaths. It would take away so little from the multi-use cyclist. George’s factual analysis of erosion is also accurate. The trails that were destroyed by the Bike race rehabilitated in one year. This speaks volumes about the trail coverage in Royal Gorge. However, IF you walked those trails in the late summer after the bike race, you walked through a ton of dust. IT is exactly this type of erosion that the dedicated hiker would like to avoid yet the cyclist is unconcerned about. I walked the trails with George, other SLCWD representatives and the Land Trust. John Svahn said the Land Trust would not manage the dust created ON the trails by cyclists and admitted that cyclists cause more erosion than walkers, unless walkers are so great in number that they create continuous contact with the ground (like the cyclist). I also agree with George about enforcement being a problem. The Land Trust, however, says it is committed to identifying problems and dealing with those problems. Although the number of problems might increase with some single use trails that are traveled by prohibited users, if a system is in place to deal with problems, that specific problem could also be addressed. Finally, George touts Hole in the Ground as an example of a great multi-use trail. That comment alone reflects the huge void between George’s experience and mine. The dust and slippage on that trail from the dust is extraordinary. I quit walking that trail 10 years ago and to me, it is the perfect example of how much damage extensive bicycle use can do to any trail. If Hole in the Ground becomes the norm on the Royal Gorge trails, I cannot imagine that folks will be happy. It is not my intention to get into a back and forth argument about favoring one group or the other here. In fact, if it is somehow not clear by now from my posts, my point is that all groups should have equal access with no preference for any group. I see Karen’s comment as another attempt for one group (what I consider the hiking only group) to try to promote preferential treatment of their use over others and that is what I malign. I would only like to make the following observations of what I consider inaccurate statements in Karen’s comment. The accusation has been made that the outreach program was inadequate. I have covered the outreach program in some detail in the first post of this series and will not rehash it here. Suffice it to say that that is boggles the mind that a 3 month campaign with over 10 meetings/presentations, an online survey and a completely transparent process is considered inadequate. It is true that there is a group that complains that they feel they were not “heard”. Unfortunately, I believe that this is not a case of a group not being heard. I believe that all groups that provided feedback were heard. The reality is that the final policies adopted by the land trust attempt to satisfy the general consensus and not necessarily the preferential requests of particular group. The adage about the impossibility of pleasing all of the people all of the time springs to mind. The preferential hiking only argument was heard but was not adopted universally because it is contrary to the spirit of equal use promoted by the Land Trust. The other point I would like to address is the comments concerning the SLPOA Stewardship Committee. (DISCLAIMER: I was a member of the Stewardship committee up until last month) It is true that many of the members of the committee do support multi-use. It is not true, however, that the committee was tasked with polling the community last summer. As the mission statement states, the committee was to serve as a conduit between SLPOA members and the Land Trust. The committee did provide information at Lot 1 and gathered feedback during weekend events. This was also supplemented by a web site open to all members and a feedback channel was provided through the website to gather community comments from any member of SLPOA. With respect to the hiking only issue this was again not a case of that group not being heard. Several letters and phone calls to committee members were received from Nancy Minges and Sid Cronin in which their position was made perfectly clear. All of this information was passed on to the Land Trust in the committee’s role as a conduit. Again, the requests of the group were heard loud and clear both by the Stewardship Committee and the Land Trust. It is not the mission of the committee to promote requests by residents, but simply to pass them on to the Land Trust. The requests were passed on and were definitely heard by the Land Trust. The fact that the Land Trust decided to assign a small number of trails as hiking only was in part a response to those requests. After all is said and done, however, the Stewardship Committee has no control over the final plan adopted by the Land Trust. I, like George, do not want to get into further debate, but also like George, I have a few responses to his comments. First, I also believe the Land Trust did a great job of outreach but ALL of its outreach was in slightly over two months. In the overall scheme of things, that is not much time and given the variable summer use at Serene Lakes, the short time frame outreach is undoubtedly one of the reasons that some folks feel disenfranchised. Second, in relationship to the Stewardship Committee, although they forwarded all comments they received to the Land Trust, as George purports, they did NOT do a good job of informing the Community of their existence. Unfortunately, it required outreach to let the Community know that the Stewardship Committee was taking commentary, and since a lot of the Community never visits Lot One, the Lot One outreach was insufficient. Further, the Stewardship Committee web site was on-line rather late in last summer’s process. Finally, as I have asked before, is there some reason not to consider the Mingas survey as we delineate what the Community wants? What are we afraid of hearing? As a member of the SLPOA Board, I got a copy of the two spiral bindings with the survey results and although I could not draw conclusions from the survey portion, the commentary from respondents was telling. Even if the survey was biased as some folks assert (in a very vitriolic manner by some), the comments from the respondents to the survey are legitimate and paint a picture of a lot of the Community that are not happy with the final Land Trust plan. At a minimum, the Mingas survey supports an absolute need for further outreach and hopefully, consideration of the opinions received. While I really really don’t want to continue this thread because it is giving this issue much more attention than it deserves I can not let the inaccuracies and misinformation stated by Karen stand. The first outreach meeting held by the Land Trust was June 15 and the last was August 31. That was 77 days in which they had over 10 meetings at several different locations both on and off the summit with a variety of stake holders and user groups. There were two formal presentations made in the Serene Lakes community and Perry Norris was present at SLPOA board meetings during the summer. The meetings were publicized by the Land Trust, SLPOA, DSAA and this very website and there were flyers up at the Post Office, Summit Restaurant and the General Store and they were published in all the summer SLPOA newsletters. It is just ridiculous to try to accuse the Land Trust of not doing sufficient outreach. As everyone up here knows, the majority of people are only up here during the summer, usually on the weekend, so it just made sense that the Land Trust would concentrate their outreach efforts during the summer. I do not believe that the duration of the outreach program has anything to do with why some people feel disenfranchised. I believe they feel this way because they didn’t get the restrictions on trail use that they wanted. I can only assume that Karen’s comments about the Stewardship Committee are made out of ignorance. The Stewardship Committee had its first meeting June 15th, 2013 at Ken Hall’s cabin. At that meeting it was decided that the initial role of the Committee would be to provide information to the community via an information table at Lot 1 and gather any feedback from residents at that time. It was decided that the Committee would not actively poll the community because it was felt that it would duplicate the Land Trust efforts and add to “survey fatique”. It was felt by the Committee and Ken Hall, president of SLPOA at the time, that the Committee would assume a more active role once the Land Trust had completed its outreach and presented a plan and would serve as a conduit between the Land Trust and SLPOA. This is exactly what the Committee did. It was not until the middle of July that the Committee chairman started to receive letters from the community (including one from Karen). At the second meeting of the Committee on August 10, 2013, it was decided that the Stewardship Committee would pass any correspondence it received on to the SLPOA board and the Land Trust. The Committee was not assigned the task of informing the SLPOA membership, a task more appropriately performed by the board. It was not that the Committee “did NOT do a good job of informing the Community”. It was that it was not the Committee’s job in the first place. It is true that the Stewardship Committee website did not go online until the first week of August, but that was because it wasn’t until then that the Land Trust Trail Plan was being formally presented. To try to blame the Stewardship Committee for not doing their “job” can only be due to ignorance of its role at best and disingenuousness at worst. I have tried to avoid commenting on the so called “survey” run by Nancy Minges and Christina Oldenburg. While Nancy and Christina admit that their methods were by no means scientific (and I would argue pretty biased), they don’t let that stop them from trying to draw conclusions that support their proposed restrictions on the trails. Sorry but you can’t have it both ways. If you want real data to support an argument then gather it correctly. I read every letter in what I call the book of rants. What Nancy and Christina did manage to do was gather a spiral bound collection of complaints and rants from a small part of the community. Her survey was really just open season for anyone with a pet peeve to express it. Do we all know that there is always going to be a small percentage of the community that has a complaint about this or that. Of course we do. How they translate their book of rants into the voice of the community is beyond me. In answer to Karen’s question; Yes I think everyone’s input should be heard and considered and in fact I think it was heard and considered by the Land Trust. Fortunately, after the input is considered, we live in place where as a rule we don’t let small self interest groups impose their restrictions on the majority of us. It’s kind of what democracy is all about. That’s my last word on this post. As a new community member and joined the SLPOA Homeowner’s Association when we purchased our home–I knew that there was a Stewardship Committee as I read the minutes and newsletter all last summer. We also attended most of the meetings led by the land trust. As cyclists and hikers we never once thought to advocate for biking only trails. We (my family) feels strongly that trails should not be segregated for use and that the spirit of being a good neighbor should extend to the trail.